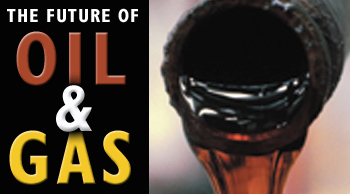 Amidst news reports that the world might soon hit its peak oil supply, two U.S. Geological Survey experts describe why determining how much oil and gas remain to be tapped is a task that is far from clear and easy. We will soon pass from an economy that primarily uses carbon-based fuels to one that primarily uses hydrogen-based fuels. What will hold us over during the transition? Inorganic oil: Much ado about nothing? What will become of the libraries of retired geologists? How much will a federal Department of Homeland Security affect the geosciences? Talk is increasing on coalbed methane as the future of U.S. natural gas. Photo montage created by Mark Shaver. Image sources are, clockwise from left: traffic in Detroit, Ohio (AGI files); The Suncor Energy Inc. oil sands plant near Fort McMurray, Alberta, Canada (Mika Madunicky/Alberta Energy and Utilities Board); OPEC President Rilwanu Lukman before a Sept. 19 OPEC meeting in Japan (Koji Sasahara/Associated Press); the Hibernia Platform on the Grand Banks (from Hibernia Management and Development Inc.); the oil tanker Polar Endeavour on its way to Port of Valdez, Alaska, in July (Associated Press/Phillips Alaska Inc.); an Amtrac from the U.S. Marines Second Division Feb. 24, 1991, near the Saudi-Kuwait border prior to the start of the ground war against Iraq. (Associated Press/Sakayuki Mikami).